To begin making Kathirikai Poondu Pirattal Recipe (South Indian Style Brinjal Stir Fry With Garlic), chop the brinjals vertically and place them in a bowl filled with salt water to avoid oxidation. Dry roast the ingredients mentioned (under �to dry roast and grind�) on a medium heat and dry grind into a semi coarse mix using a Mixer grinder and keep aside. Heat oil in a Heavy bottomed pan over medium heat, add mustard seeds and chana dal and let it splutter. Add the curry leaves and dried red chilli and allow it to crackle. Add the garlic pods and fry until it becomes slightly brown. Add the finely chopped onions and cook until translucent. Now, add the slit brinjals, turmeric powder, and season with salt. Stir, sprinkle with a little water and cook the brinjals on a low heat with the lid closed. It will take around 10 minutes. Once the brinjals are cooked, add the ground spice mix and stir well. Let the brinjals roast for 3-4 minutes, occasionally keep stirring in between and switch off the flame. Serve the Kathirikai Poondu Pirattal Recipe (South Indian Style Brinjal Stir Fry With Garlic) along with Steamed Rice, Chow Chow Kootu and Village Style Pepper Rasam along with Sabudana fryums to make an interesting Chettinad cuisine influenced Sunday lunch. 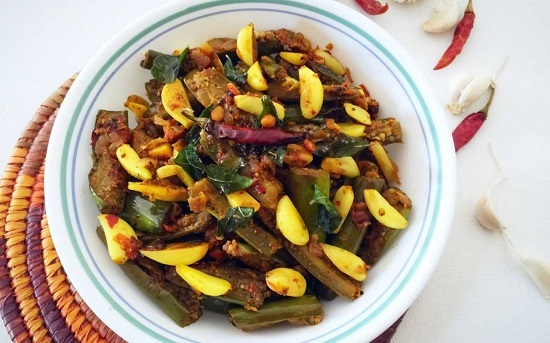 Kathirikai Poondu Pirattal Recipe is an aromatic brinjal stir fry dish with garlic. The freshly roasted and ground spice mix renders a beautiful flavor to the regular brinjal. This recipe is a specialty of the Chettinad region of Tamil Nadu. Serve this Kathirikai Poondu Pirattal Recipe along with Steamed Rice, Chow Chow Kootu and Village Style Pepper Rasam along with Sabudana fryums to make an interesting Chettinad cuisine influenced Sunday lunch.